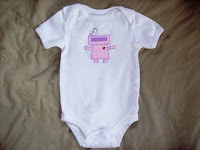 So stop by and check out our super cute robot baby girl items (probably best to not do it after eating) and enjoy! Belle's Bows now for Sale! !